The wooden slide was a crowd-pleaser already at the country’s first fair organised in the summer of 1920. Messukeskus Helsinki, Expo and Convention Centre’s centenary gets off to a playful start with a slide set up in its facilities. You can slide your way to the largest hall in Messukeskus, starting with the Matka Travel Fair. The slide was a great audience attraction already at the country’s first fair a hundred years ago. Messukeskus will also celebrate its hundred-year-long story with its redesigned logo. 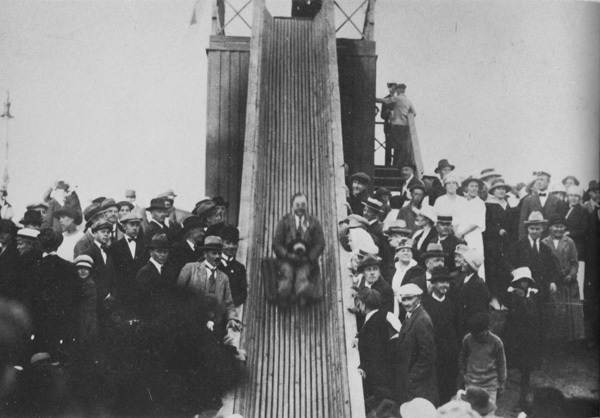 The wooden slide was a crowd-pleaser already at the country’s first fair organised in the summer of 1920, just three years after Finland had declared its independence. In honour of its centenary, Messukeskus will reintroduce the slide at its public events as a light-hearted alternative to stairs and lifts. The slide will be available at almost all of the Messukeskus events during the centenary year. “All of us at Messukeskus are happy to invite our customers to join us in celebrating our centenary. For a hundred years, Finns have been an enthusiastic audience at exhibitions and fairs, and event marketing continues to be an excellent marketing channel both in Finland and worldwide,” says the Managing Director of Messukeskus, Anni Vepsäläinen. 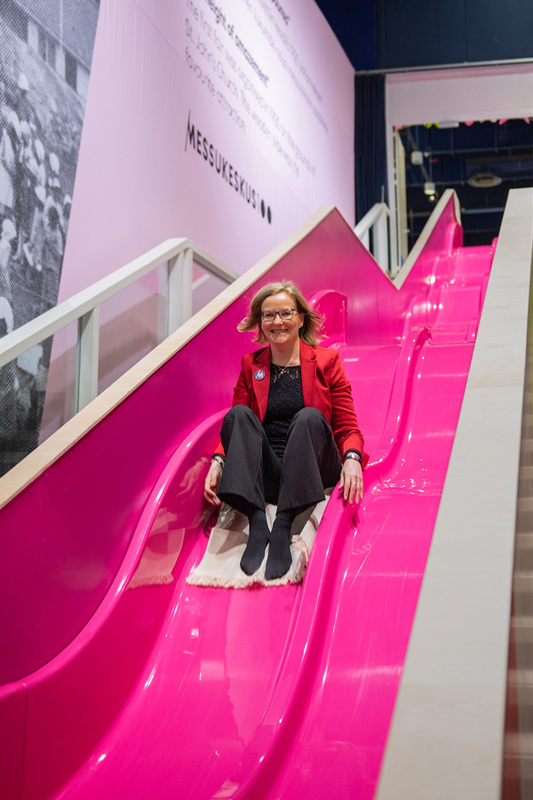 Managing Director Anni Vepsäläinen testing the slide opened in honour of Messukeskus’ centenary. Link to the video in the end of the press release. In celebration of the jubilee year, Messukeskus has renewed its graphic image and included the symbol of its centenary in its renewed logo. The new logo was designed by graphic designer Noora Westerlund, who works at Messukeskus. The centenary symbol now forms a part of the new logo: Messukeskus – a century in the centre of events. The hundred-year-long story will also be seen in other Messukeskus facilities. In honour of the occasion, the Olohuone café located near the southern entrance will be completely refurbished to reflect the renewed brand. The café interior was designed by designer Mirjami Rissanen, who works at Messukeskus. Olohuone is decorated with floral meadows wrapped around the café’s columns, handcrafted from the Messukeskus carpet. The surface of the service desk is made from Finnish fully recycled Durat material, and the floor created by Bolon is made from fully recycled, woven eco-vinyl. February will see the launch of the centenary campaign, during which the customers and influencers of Messukeskus will share how its events and various encounters at its events have influenced their lives and careers. These fascinating stories will include those of the Creative Director of Hakola Oy, Annaleena Hämäläinen; the ocean racing sailor Ari Huusela; entrepreneur Hans-Peter Siefen and YouTube personality Mike Bäck. The jubilee year will continue in March with the Mesoaja Gala hosted by Messukeskus. The fair and event successes of the year will be awarded at the gala. At the same time, Messukeskus’s renewed restaurant world and the hotel Holiday Inn Helsinki – Expo will reopen their doors to reveal the results of their complete refurbishment. Messukeskus began its success story a century ago. The Finnish Fair Corporation was founded on 19 October 1919, as Finland was taking its first steps as an independent nation, with the mission to promote Finnish business through fruitful encounters. Our first fair was held in the summer of 1920 outside St John’s Church in Helsinki, amidst a bustling startup spirit. The fair grew to become a massive public festival and the largest media event of its day in Finland. Over 120,000 visitors from around the country flocked to the fair, nearly doubling the population of Helsinki at the time. Our journey has since taken us to the former exhibition hall in Töölö and most recently to Pasila and the largest event venue in Finland. We organise some one hundred public and trade fairs each year, as well as around 2,000 meetings, congresses, parties and corporate events. Messukeskus Helsinki, Expo and Convention Centre promotes Finnish trade and industry by enabling productive face-to-face contacts at trade shows, conventions, conferences and other events. Exhibitions and fairs are Finland’s seventh largest media. In terms of impact, they are the most profitable, the richest in experiences, and the most social of all media. About a hundred fairs and exhibitions and 2,000 meetings and congresses are held annually at Messukeskus, with more than a million participants. The Finnish Fair Corporation, the company that owns Messukeskus Helsinki, celebrates its 100th anniversary in 2019.